Mohamed obtained his Bachelor of Science from Boston University – School of Management in 2013. He later obtained his LLB and LLM from BPP University in 2014 and 2015 respectively. 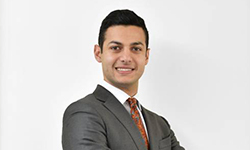 Mohamed joined the firm in 2014 specialising in corporate and intellectual property law. In his corporate law practice, Mohamed has assisted in various contracts for high profile clients worldwide. At Eldib & Co he handles the revision and drafting of commercial and agency and distribution contracts and prepares reports for legal consultations. He has also conducted litigation claims on behalf of multinational companies in instances of counterfeit products appearing in the market. Mohamed is a member of the Egyptian Bar Association, International Trademark Association (INTA), Association Internationale Pour la Protection de la Propriété Industrielle (AIPPI), American Chamber of Commerce in Egypt (AmCham), and the Egyptian Association for Protection of Industrial Property (AEPPI).